With a plethora of choices to spoil you with, have you recently taken a glance at the New Flat in Kolkata? Built with a futuristic vision and laced with luxurious amenities, these properties can be perfect abode for you and your loved ones. Now, you must be thinking about how to do the interiors of your apartment to make it look even more majestic and enthralling so that it compliments with your style of living. The Aspirations Group has the right remedy for all your worries. Gallery Walls! 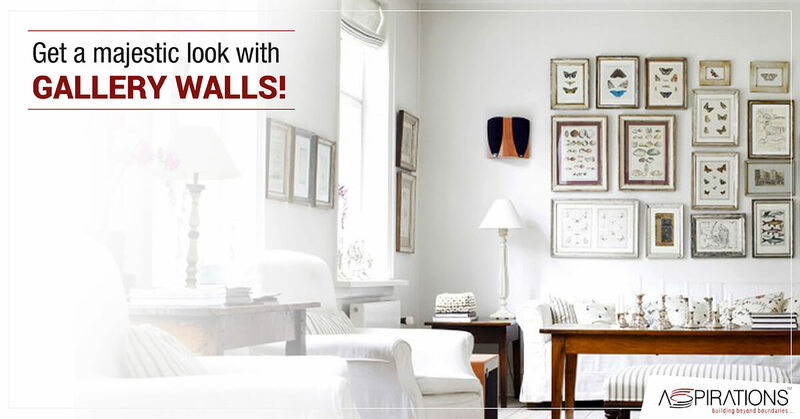 Yes, gallery walls can be quite interesting to make your space look amazing. Infuse patterns and colours in your newly purchased apartment and show off your artistic skills in an exquisite manner. Create a display wall in your home and make it look lively by putting up photographs from your favourite vacation, family portraits, paintings, mirrors, vintage dishes or patterned metal hangings. It can be anything unconventional that will highlight your experiences or, make you go back in time and help you cherish some fond memories. Start by decorating an accent wall in your apartment, preferably in your living area. This is a great idea for doing a gallery wall as it will be readily visible to everybody, who visits your place. Keep it minimalistic and chic to draw attention. Also, this is an easy way to create a feeling of warmth and comfort in your home. Let’s look at the few ways of creating a great gallery wall brought to you by the most trusted real estate developers in Kolkata, the Aspirations Group. The key to an excellent design is to choose the right colour that melts aptly with the mood of your space. You can use bright poppy colours like pinks or yellows to give your area a teenage feel. For example, you can hang pictures in pink frames or put up a wall art having a bright crimson shade and compliment it with metallic art pieces or add a golden rusted mirror to add charm to the place. You can use subtle tones if you are planning to decorate your home with a vintage style. Hang some copper artistic elements against a muted yellow or grey background and add frames having dark colours. This will enrich your living room and make it dynamically astounding. Displays having a particular theme can be admiring. Pick up a theme of your choice and stick by it. Like, for example, if you’re an animal lover, then you can put up animal sketches, paintings or metallic knockers of an animal face. Make your living or dining room look more polished by adding a themed gallery wall. Neutral themes are incredibly adaptive and can go well with all types of designs. Pair it with contrasting textures like wooden frames or a silver mirror to reflect the light and make a stunning, unique statement. A disorderly fashioned gallery wall can be more attractive than an ordered one. Maintain the consistency, yet connect all the different objects to strike the right note. Keep your editorial eye open and add objects that have a certain amount of similarity. You can design an accent wall by placing pictures of monuments, antique mirrors, portraits, bone china plates with floral motifs, or curio. Place these elements along with simple black frames against a matte white background to define the consistency, yet leaving space for creativity and innovation. Add the right furniture units to pull out a great living space in your home. So, why wait any longer? Buy your dream home and choose from the best upcoming residential projects in Kolkata to flaunt your artistic skills. Don’t forget to add a gallery wall to your home and make your living more extraordinary!